Peugeot hybrids | What Car? Peugeot offers three hybrid cars in its range: the 3008 Hybrid4, 508 Hybrid4 and the 508 RXH Hybrid4. All cars are diesel hybrids. The 508 saloon does average economy of 78.5mpg and emits 95g/km of CO2. The 508 RXH averages 68.9mpg and emits 107g/km of CO2, while the 3008 does 83.1mpg, with emissions of 88g/km. The three cars are powered by a diesel engine and an electric motor combined with a semi-automatic gearbox. The 3008's interior is comfortable and practical. It comes with climate control, Bluetooth, electric windows and rear parking sensors. The hybrid system works very smoothly and the car has impressive pace. Both 508 hybrids have a classy interior with room for five. The middle, rear passenger benefits from good legroom thanks to the small transmission tunnel. The saloon comes with climate and cruise controls, electric windows, heated seats, alloy wheels and rear parking sensors. The estate version gets Bluetooth, climate control and front and rear parking sensors. 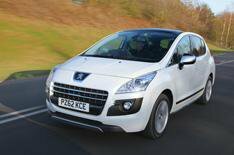 Prices for the 3008 Hybrid4 start at £25,195. The 508 Hybrid4 starts at £31,450 for the saloon and £33,895 for the RXH Hybrid4.